Our final entry in the competition. The winner will be announced tomorrow! Randy and I are deliberating right now - with all of the great entries, it's going to be tough! But in the end there can be only one! This is the Survivor by Dajo. It's a hollow ground drop point blade made from a good grade of Chinese stainless steel. 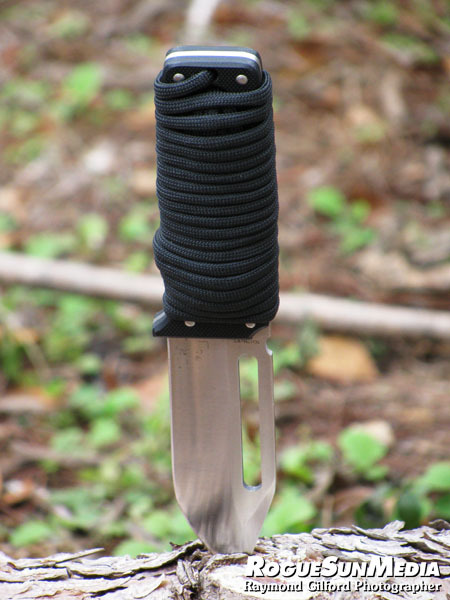 I was able to wrap about 10' of paracord around the handle because of its unique design. This makes the grip a lot more comfortable than the G10 scales alone. It has a 7.5" total length. The sheath is fairly decent and includes a Swedish firesteel. I've done some branch trimming in the field with it and it holds an edge pretty well. I'm still learning to improvise the other necessities like cordage, etc. But without a decent blade, those jobs are all a lot harder.